Being a Brentwood lad, I have many rich and treasured memories of Christmas as I grew up in the town, though never once imagining I would see Hansel and Gretel by Wilsons Corner. I would not lose those memories for the world, but now cast an envious eye at what the youngsters of today are getting to fill their Christmas stockings. In my day the only entertainment was the Odeon cinema, but now we have Brentwood Theatre in Shenfield Road, which has itself grown into adulthood and is a jewel in the town’s crown. Everyone does pantomimes and some years ago the theatre management turned to David Wood for Children’s Stories. 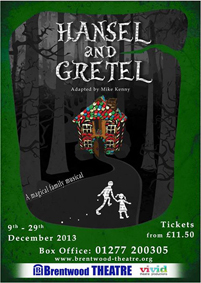 This year is no exception, choosing an adaptation of the Brothers Grimm Fairy Tale, Hansel and Gretel by Mike Kenny. Set in the present day of a financially struggling family, the play erupts into life when the children turn their noses up at the food on the table and attempts by their parents at conversation. Mum and dad share one of those unspoken glances a few yards short of an hysterical pre-emptive strike, and settle for the smiling Max Bygraves rendition of: ‘Let me tell you a story’. Using the Grimm’s story as a vector, it has all the elements of being inspired, particularly in the current climate when everyone is feeling the pinch, and the proximity of the Festive season and good will to all. Directed by Joe Walsh and designed by David Zelly, the team have parachuted in four remarkable young actors for the run. Charlotte Bradford: playing the Mother, went to the iconic East 15 Acting School, sung at the BBC Proms with Bryn Terfel, and regularly appears in her own one woman cabaret show. Add to that the longest running comedy, NewsRevue. Hannah Douglas: She appeared at Brentwood two years ago as Jemima Puddleduck and says it is great to be back. Has just finished a tour of ‘Ghosts’, ‘Touched’ by Tom Daley, ‘Midsummer Night’s Dream’ and appeared on TV in ‘Little Dorrit’. Stephen Ryan: Hails from Limerick in Ireland and trained at the Mountview Academy. He has appeared in many shows including ‘HMS Pinafore’, ‘The Best of Abba’ and ‘Big, the musical’, to name but three. Paul Tonkin: Shakespearean actor having taken the lead in Hamlet and been on many Shakespeare tours. A Singer songwriter, he composed music for Twelfth Night and East of the Sun, West of the Moon. The show runs from Monday December 9 until Sunday December 29. Tickets are £13.50 and £11.50 concessions and available from the box office on 01277 200305 or http://www.brentwood-theatre.org to find out performance dates and times.